09-Dec-2004 -- Finally we are approaching our port of discharge, Mostaganem, in whose vicinity there is a nice offshore Confluence, 36N 0. Unfortunately, it was a rainy morning, and so the pictures are not as beautiful as we wished, although the coast is very close. To the ENE, we see the coast around Cap Ouillis, to the SE there is Mostaganem, to the South we can see Stidia Plage, to SSW we can see several oil storage tanks at the oil terminal of Arzew, and finally to the Southwest, we can make out the eastern coastline of the Golfe d'Arzew and Cap Carbon, where the town of Arzew is located. A closer look to the town of Mostaganem, which has a population of about 130,000 and is a typical smaller, but rapidly growing Algerian town. The architecture around the old town is a little bit "bric-à-brac", but nevertheless not unattractive. 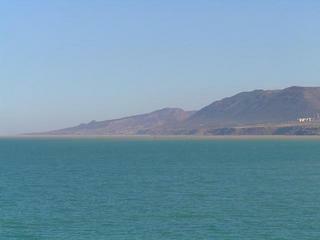 A small Algerian fishing boat was circling around as well in the area. On December 12th, we finally got our berth and entered the port in the afternoon, in order to commence discharging operations. If one or the other readers will happen once to visit Mostaganem: one of the tourist sightseeing highlights is the grounded wreck just north of the port. How this happened? Well, the Golfe de Arzew is subject to frequent sudden strong westerly winds. If ships at the anchorage subsequently start dragging their anchors and do not get ready their engines in time to steam away towards the open sea, they may rapidly end up grounded off the eastern end of the bay - and then her owners can call Lloyd's in London to claim a total loss. Algeria is a country where I personally always love to go. Although much is not easy due to a lot of economical and political problems and an awkward bureaucracy, the people there are as friendly as one could wish. The are very polite and even after more than 40 years of independence with a strong French touch. In the sea, but with a view of land.